The table looked more like a gathering of undertakers than a comic book convention booth. 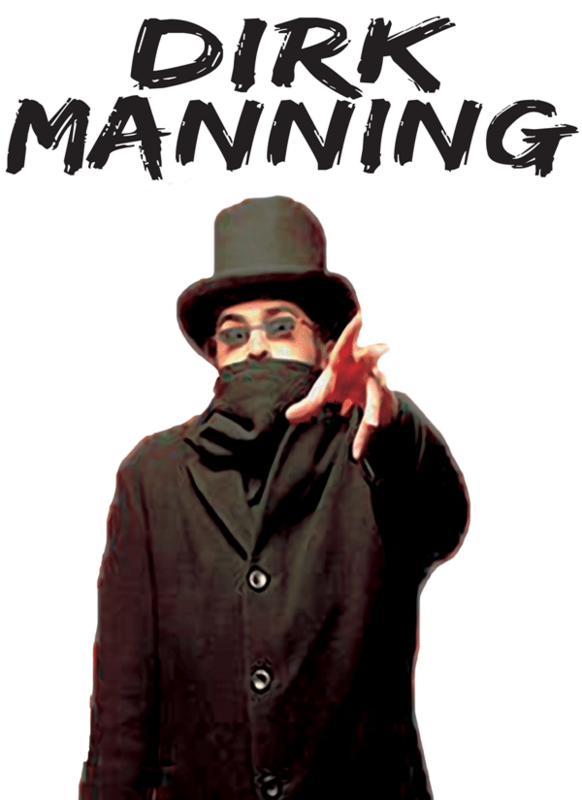 Intrigued, I got closer and noticed that the prophet spearheading this black-clad cult was Dirk “I scream” Manning from Hell, Michigan. He was front and center, graciously greeting, and testifying to the horrors trapped between the two covers of his books. This man’s approach was different and he certainly stood out from the other creators, who were also promoting their wares at this, the C4 comic-con, one of the largest in his home state. But what was it that made this creator stand out in a sea of creators? Was it the black attire accented with the clean-cut, slicked-back hairstyle? Or was it that he was readily available to anyone who wanted to hear his testimony of terror, never taking a back seat behind the books? This guy walked and talked the part of a true creative professional and you could tell this was not his first rapture. 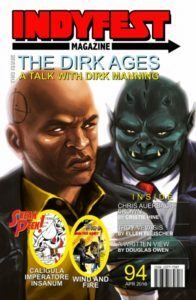 He not only knew how to market himself, but he was also teaching others the dark arts as well—and that, my friends, is what drew me into the faith of the Dirk Ages. IM: Having met you in person several times, you seem very generous, hospitable, and easy to be around. So why, when you put pen to paper, does such terrific terror come out? Why such horror? My point being, GOOD horror is ultimately about the human condition. GOOD horror asks (and sometimes answers) the question “What would you do if…?” That, to me, is a fascinating question that is best—and oftentimes most profoundly—answered in the horror genre. IM: If you were to think back to when you first conceived Mr. Rhee, what would you attribute as his driving inspiration? 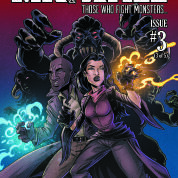 IM: Rumor has it you are starting a Kickstarter for Volume 3 of Tales of Mr. Rhee. Are you at liberty to discuss any details of when you plan on launching it? What do you hope to accomplish with this Kickstarter? DM: Kickstarter has been a wonderful way for me to be able to have my work directly funded by the people who are most enthusiastic about my work, while also hooking up this segment of my readership with all kinds of cool bonus swag. To that end, my goal with this campaign is to do the same thing I did with the first two campaigns— especially the second one: Offer people who pre-order the book through Kickstarter an exclusive hardcover edition of the book, as well as a slew of cool Kickstarter Exclusive stretch goal rewards and swag. IM: What are some of your planned goals and prizes for this Kickstarter? I know you have permitted people to become characters in your books previously. This is such a fun concept and motivator for people to participate in the crowdfunding. Are you planning anything similar for this campaign? That aside, a lot of Tales of Mr. Rhee revolves around things happening in coffee shops—the coffee shop “Dirk’s Perk,” to be exact—so… expect to see some really (RHEE-ly?) cool rewards centered around that, for sure. IM: I love where Mr. Rhee’s story is going. This is a series that grabs you from the first book you read, regardless of which issue it is. The post-rapture world that these characters fumble through is intriguing, yet horrific, to say the least. I think one of my favorite series was in Volume 2, issue 2. We not only meet a host of angels and masked superhero types of characters, but we also get a great scene of Cthulhu inflicting havoc on Megalopolis. Will you be revisiting any of these characters in the future? Do you plan on exploring the Great Sleeper himself more in pages to come? All hail Cthulhu! DM: Ia! Ia! Cthulhu fhtagn to you as well, my friend! May the faithful be eaten by our great tentacled overlord first, so that we will be spared the madness sure to engulf all mankind when the stars once more enter their proper alignment and the sleeper rises from the sunken city in R’lyeh! 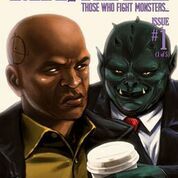 Crypticness aside, let me just say this: I didn’t introduce the storyline involving Cthulhu and The Jovian from my other comic series Nightmare World into the pages of Tales of Mr. Rhee just for window dressing. There’s a big plan in place and seeing them both pop up in small(ish) roles in both Volumes 1 and 2 was a reminder—and, perhaps, a little bit of a tease—that there’s still some unfinished business with them both from the Nightmare World plot that will eventually be definitely concluded in Tales of Mr. Rhee. Well, there’s no bigger gun—or guns, in this case—than a superhero and a giant octopus-headed demi-god who seemingly killed each other in a battle at the end of the world… and while I can say that The Jovian is absolutely, unquestionably dead (as discussed in the character handbook at the end of the Tales of Mr. Rhee Volume 1 trade paperback), the story between these two isn’t over yet… but it will be finished before—or, I daresay, as—Tales of Mr. Rhee reaches its natural conclusion, as well. IM: I’m willing to bet you write way ahead of your stories. Can you give us any hints on what is in the future for Mr. Rhee? DM: I planted seeds for pretty much everything that’s going to happen throughout the course of the series in the thirteen stories that comprise Tales of Mr. Rhee Volume 1: “Procreation (of the Wicked)”, so savvy readers can go back to that volume and, perhaps, start to extrapolate what’s coming. As you mentioned, we saw hints of both Cthulhu and The Jovian in Volume 1, and we saw a bit more of that storyline unfold in Tales of Mr. Rhee Volume 2, as well. And, as I just alluded to, we’ll be returning to that even more at some point. We also finally caught a glimpse of how psychotic Thelma Lushkin has become in Chapter 8 of Volume 1, and we then saw that in much more detail in the closing pages of Issue #2 of Volume 3… and that’s something that’s going to factor in more and more as the series goes on, as Thelma Lushkin, her demonic bodyguard/lover William, and Dumashine Enterprises are going to be revealed to be major villainous factors in the series—sort of the yin to the yang of The P.R.O.M.I.S.E. Group. The biggest elephant in the room is probably Jack Faust and Ranobus, though… who could easily (and rightfully) be seen as Mr. Rhee’s arch-enemy. Volume 4 is going to see the return of Faust/Ranobus (Faustobus?) as he’s none too happy that Mr. Rhee was freed from the prison he was left in at the end of Volume 1. IM: It all began with Nightmare World, and now we see another installment on the horizon. What are you planning for Volume 4? What is up your sleeve for this one? 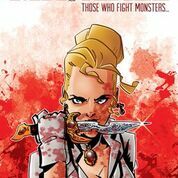 DM: I’m so excited that, at long last, I’m going to be able to bring Nightmare World Volume 4 to print, hence bringing the series to its natural conclusion. This has probably been the book of mine people across the country (at least) have been waiting more for than anything else, so I know that this one has to deliver… and it will. In Nightmare World, each volume contains thirteen stand-alone genre-hopping horror stories that all weave into one giant uber-story about Lucifer awakening Cthulhu to kick-start the second war with Heaven. 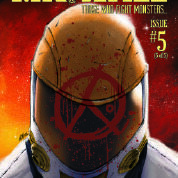 While, due to the way that we structured the release and order of the stories in the first three volumes published by Image Comics, that uber-story reaches a natural ending… there’re also a few plot-threads that could use a bit more resolution and that’s one of the things we’re going to be doing in Nightmare World Volume 4… while also sticking with that same formula of thirteen stand-alone (yet ultimately connected), genre-hopping, eight-page horror stories that will rest in your psyche long after you’ve read them, as all the best scary short stories should. IM: Have you any special guest artist planned for the next Nightmare World? 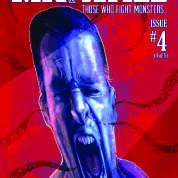 DM: A lot of the Nightmare World Volume 4 stories have been done for years, but one of the perks of waiting a while before publishing the final volume has been being able to take a step back and look at some of the stories through a fresh set of eyes, so to speak. To that end, I’m tickled to say that, along with bringing back a lot of the “classic” Nightmare World artists such as Josh Ross, Seth Damoose, Austin McKinley, Leonard O’Grady, and Jeff Welborn to the fold, I’m now going to be able to invite artists like Dan Dougherty (Beardo, Touching Evil), Howie Noel (Tara Normal), and Marianna Pescosta (Tales of Mr. Rhee), and John Marroquin (El Mariachi) to the party… and really, we’re all the better for it. Nightmare World has always been such an ambitious, passionate, and exciting project that I’m honored to be able to open the doors to so many of my other creative partners and friends for the final huzzah on what I hope will be remembered as one of the best comic book horror anthologies ever created. IM: Are you planning any other projects outside of the Nightmare World or Tales of Mr. Rhee universes? DM: Absolutely. Nightmare World Volume 4 is going to be the last official Nightmare World release, although it obviously shares a “universe” with Tales of Mr. Rhee, which will be continuing for the foreseeable future, although that series also has a natural ending at some point way down the road that we’re always moving towards. While I—like so many readers— love the Nightmare World and Tales of Mr. Rhee universes, there are other worlds to be created and stories to be told. People should start to see their first glimpse of those in 2017, latest. IM: I would consider myself a fan of Nightmare World and an avid follower of Tales of Mr. Rhee, but your book that’s had the greatest effect on me (as a creator) has been Write or Wrong: A Writer’s Guide to Creating Comics When I read it, I felt like you were talking right to me. You answered so many questions and touched on so many topics that I still reference and recommend it today. In answering many of the burning questions that creators in general have asked themselves at one time or another, it seems you may have created a whole new set of questions (for me, at least, anyways). Since I have the chance to pick apart your occipital cortex, I would like to touch on a couple topics. The first being a fan base question: As someone who has been down that road, what would you say draws in more of a crowd for a new creator looking to not only build a fan base, but also publish their story? Would you suggest going to web series first, doing small print runs, or both? DM: With the prevalence and relative ease with which one can publish comics both online as well as through print-on-demand services, at this point there’s no reason not to do both. Be everywhere, you know? Be everywhere and give readers numerous entry-points and means of accessing your work. IM: Do you find publishers are just as likely to pick up a series that started off web-based, or do you see publishers steering away from publications that have already been released to the public in a free-to-read format? DM: Now, more than ever, publishers—especially publishers of creator-owned work— are interested in series— or creators—they know will sell books and move product. Let me be brutally honest with you here: At least half of the reason Josh Blaylock of Devil’s Due picked-up Tales of Mr. Rhee was because he knew I was always out there online and at conventions selling my work. He’ll be the first to say that he was seeing me everywhere—always selling books—and that’s what made him interested in bringing me into his stable. I’m not saying that Tales of Mr. Rhee isn’t a great book or that he didn’t think people would like it—because it is a great book (in my humble opinion) and a lot of people do like it—but that was only half the reason I he picked me up. There are a lot of people creating a lot of great books out there… but if you’re not doing anything to get the word out there about them—to the point where fans are responding to the work by buying it, mind you—then it’s going to be a lot tougher for you to convince a publisher to publish your books. Conversely, let me add that there’re two sides to this scenario, though… and that’s asking what a publisher can do for you. A common misconception that a lot of aspiring creators have is that being signed by a publisher will automatically generate sales. Let me tell you and everyone reading this right now that this is unequivocally, unquestionably false. Being signed with a publisher will not automatically mean you’re selling more books. To this end, you have to do your homework—and, perhaps, engage in some tough conversations with a potential publisher about what they can do for you to help you grow your brand and your audience. Ask not just what you can do for a publisher, but what a publisher can do for you. IM: I know you are one to keep your stories and concepts a secret until published, but how do you go about submitting to publishers without giving away the farm, per se? Many publishers want to know the ins and outs of a story before they ever attempt to publish. Many new creators out there may be worried about getting their ideas stolen this way. Any useful tips on submitting to publishers that can still protect the creator’s ideas? In other words, your editor (or publisher) needs to make a decision on whether or not they are going to invest considerable time, effort, and resources into publishing your comic. To that end, they need to know everything about what you have planned and what will make your comic series appealing to readers—and vendors, for that matter. It’s OK to play “hide the ball” with your existing readership—at least to an extent—but you should never do this with the people who you’re asking to publish your work. They need to know exactly what you have in mind, so they can make informed decisions about whether to move forward on the project or not. As for ideas being stolen… honestly… if your idea for a story is so simple that it can be stolen by anyone who hears it, what’s the point in writing it? As a creator, you should be pitching stories that only you can execute well. Sure, sure… there are occasionally those “Why didn’t anyone think of that before?” concepts that almost anyone could write well—such as, with all due respect to Steve Niles, the concept of 30 Days of Night (in which all the vampires descend on Alaska and have a feast on the isolated townsfolk when there’s no sunlight for thirty days), but the fact that no one else ran with that seemingly “duh” idea before Mr. Niles is also testament to the fact that, really, he was the only one who could have written that “gimme” story concept, too. So, that being said, don’t worry about other people stealing your ideas. Rather, strive to craft stories that are so well-done no one else could do them justice but you. IM: As a writer with his tentacles in different publishers, do you prefer to loyally stick with one publisher, or do you like to play the field a little? Would you consider yourself a lone wolf? How do you view label loyalty in this field? DM: See above: Ask not what you can do for a publisher, but ask instead what a publisher can do for you. I have no problem being loyal to someone who I work well with, but at the end of the day, making comics needs to be a business if you’re going to do it in the long-term—and it’s important to ask yourself that question each and every time: Is this the right publisher for this project. I’ve been very happy with my relationship with Devil’s Due for these past few years and look forward to continuing to work with them for years to come… but there will never come a day when I don’t ask myself that question before I pitch each and every new project. IM: You have written some real, bone-gnawing, beautifully-gruesome comics in your day. As a horror writer, what scares you most? What is your greatest fear or worst nightmare? DM: Thanks, dude! I think it’s hard to genuinely scare people using the comic book format, so I take that as quite a compliment! My greatest fear and my worst nightmare are two different things. At the risk of coming close to closing this interview on a down-note, my greatest fear is probably dying alone and unmourned somewhere with no one giving a care about who I am and what I’ve done—both professionally and personally. It would mean everything I’d done in my life was for nothing. IM: If you could impart any one piece of final wisdom or advice to today’s generation of creators, based on your observations thus far, what would it be? This entry was posted in 94 and tagged Dirk Manning, Dominichi Hawkins on April 5, 2016 by aipman1.